Sew For Victory! A 40s Sewalong. February 4 – March 31, 2013. This week, Rochelle, from Lucky Lucille launched Sew For Victory! A 40s Sewalong. So exciting! I really wanted to participate, but the 1940s are difficult for me. I love the art deco styles from the 1920s and 1930s. I like the mod styles of the 1960s. I appreciate that the styles from the 1950s flatter my figure. But I’m much less familiar with the 1940s fashion-wise. 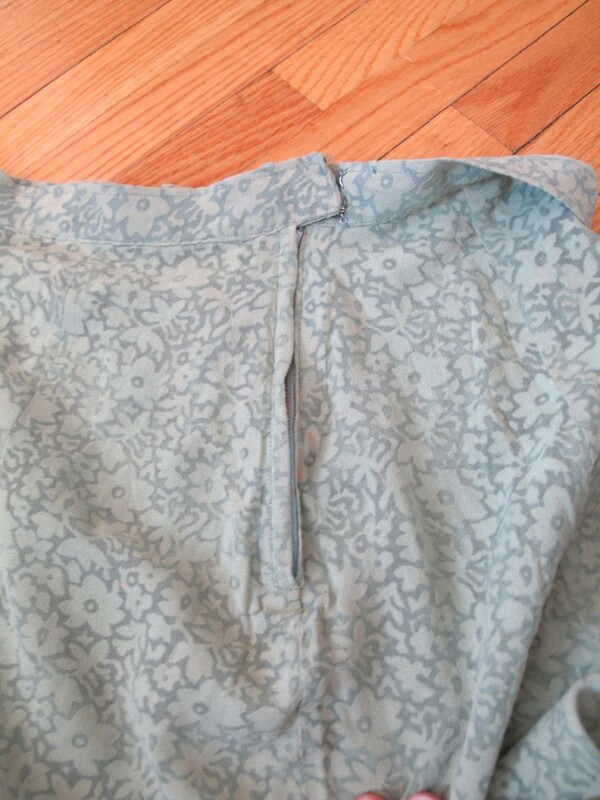 Then it occurred to me that I have a real piece of 1940s clothing in my possession – my grandmother’s wedding dress. A few years ago, when my grandmother died, the dress came to live at my house. I had put it away and I hadn’t taken a really good look at it since. So for the sew along, my plan is to remake my grandmother’s wedding dress. In the late 1930s in Vancouver my grandmother finished nursing school and began work as a psychiatric nurse. She and her friend bought a car, and throughout the 1940’s went on a number of road trips. She often told me the story of how on a trip to the states, she and her sister had stocked up on silk stockings, luxuries that were not available in Canada during wartime. She had to hide the stockings in the sleeves of her clothing to get them across the border. In 1941, the car needed repairs, and my grandfather was referred for the job. My grandfather was a truck mechanic. During the war, he worked for Shell Oil assembling tanker trucks. Since his job was considered essential to the war effort, he wasn’t drafted. My grandparents started dating in 1942, and on July 14, 1945, my grandparents were married. 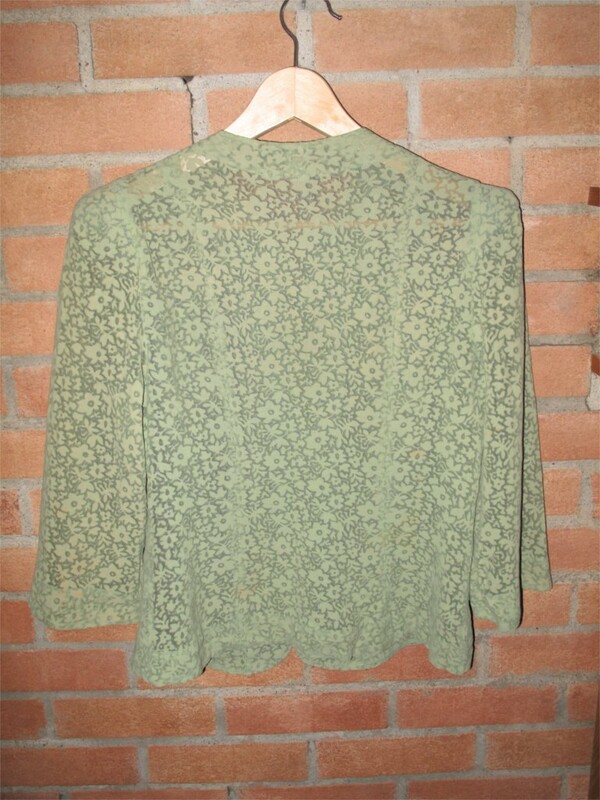 My grandmother wore a green wedding dress. When asked why she chose the colour green she stated simply that there were shortages during the war. Canada joined the war effort in 1939. Conscription was ordered in 1944. Even though the population of Canada was only 11,000,000 in 1938, over 1,000,000 Canadians served in the war. More than 40,000 did not come home. At home, rationing began in 1942 and didn’t end until 1947, two years after the war ended. Clothing was rationed using a ticket system. Silk importation ended in 1941. Nylon was difficult to find as well. My grandmother’s dress, is actually a suit. There is a 3-panel, A-line skirt that hits just below the knee. 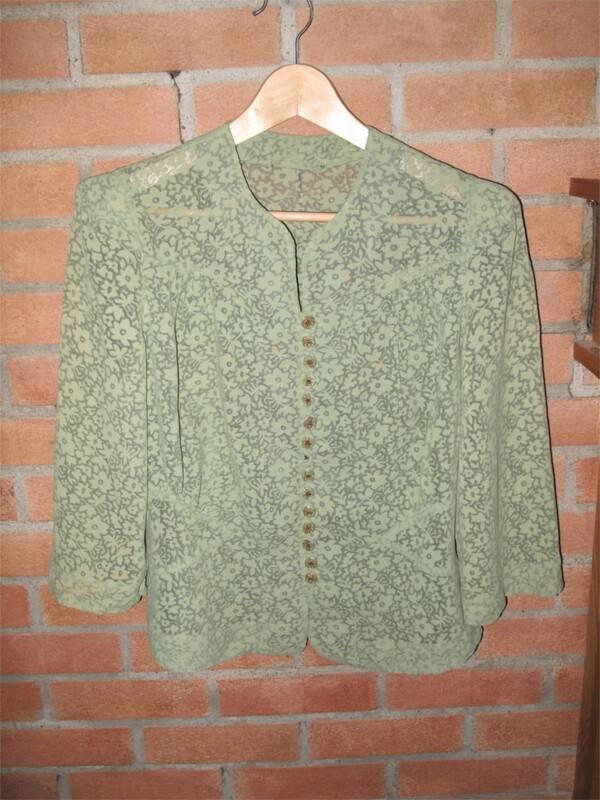 There is also a fitted jacket with 3/4 length sleeves, that buttons up the front. The first thing you notice is the colour. It’s so green! The skirt from my grandmother’s wedding dress. If you look closely you can see there are three panels, and it is an A-line skirt. The jacket of my grandmother’s wedding dress. It is so green! And so sheer! There have you gotten over the colour yet? No? Take another look. This is the back of the jacket. You can see the princess seams. Once you see past the colour, the dress design is pretty interesting. 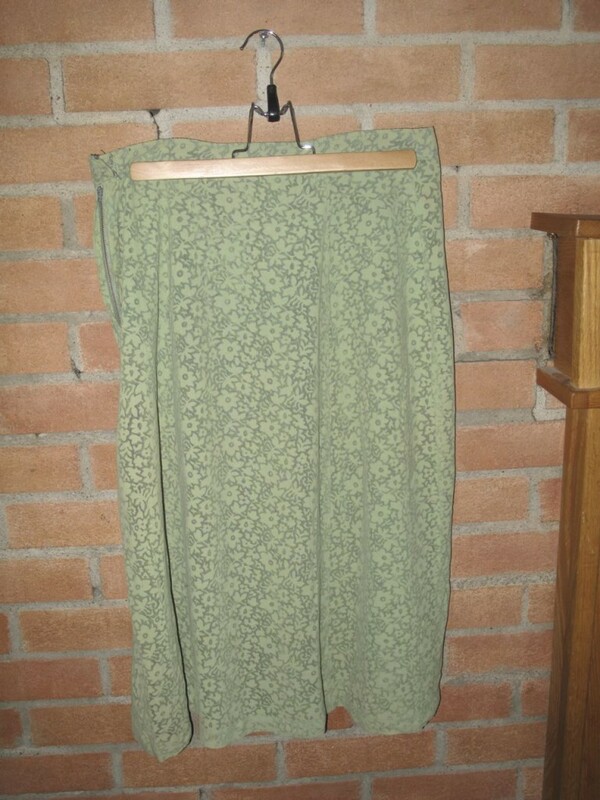 The skirt is a simple three-panel A-line skirt. It looks like there are more panels in the back, but in fact, the dressmaker simply did inverted pin tucks to make it appear as if there were more pieces of fabric. The waistband is reinforced with grosgrain ribbon and there is a rather industrial-looking zipper and a hook and eye closure. The seams are not quite even and are just finished with pinking shears. 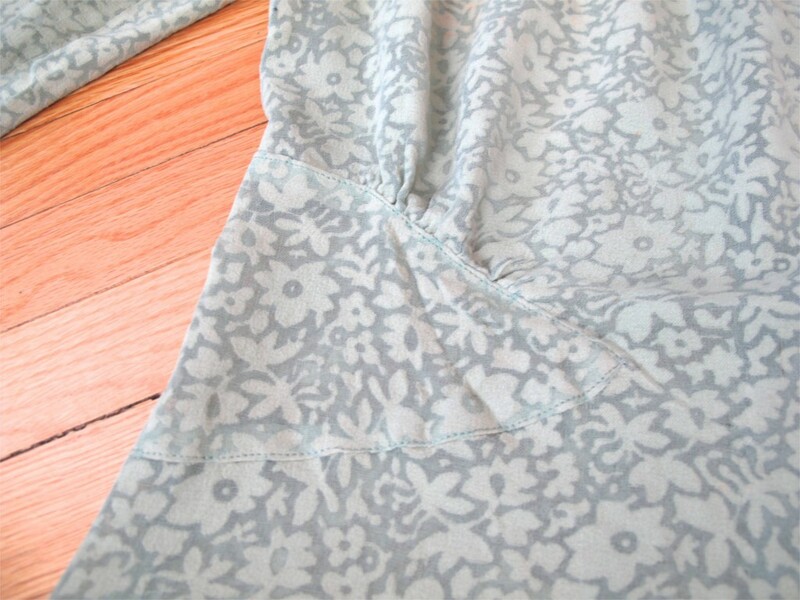 The hem is hand-stitched and the hem has been repaired. 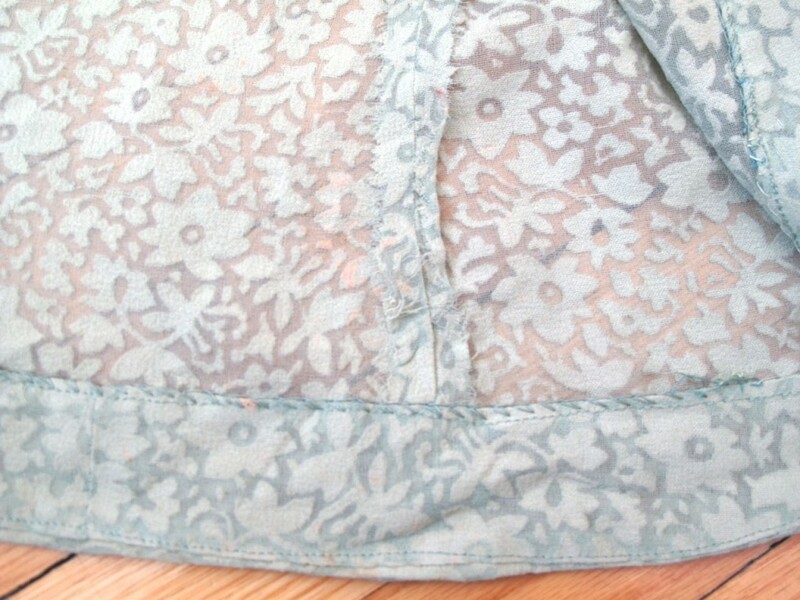 Although the skirt is sheer, there is no lining. 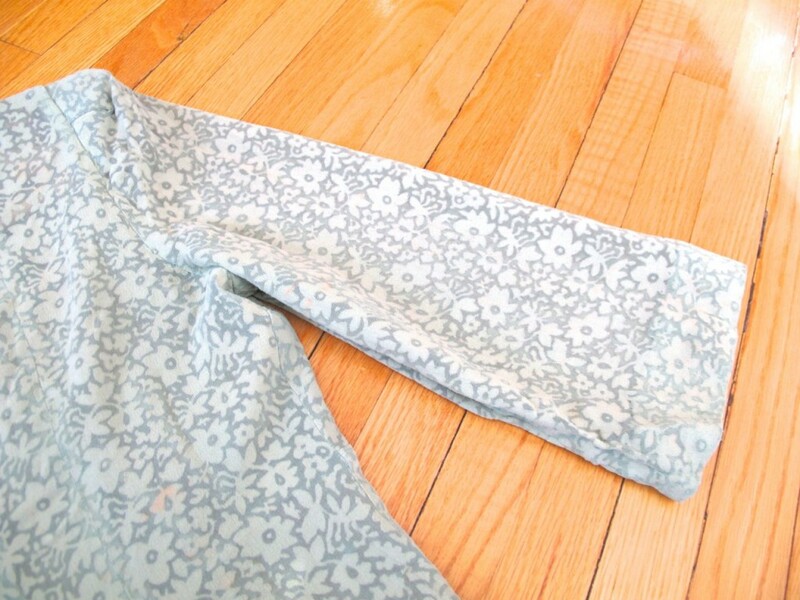 The waistband is lined with grosgrain ribbon. The zipper is not an invisible zipper. The zipper is quite heavy for the fabric. The jacket has 3/4 length sleeves that are a little wider at the bottom. There are shoulder pads (factory-made) that fit into the caps of the sleeves. 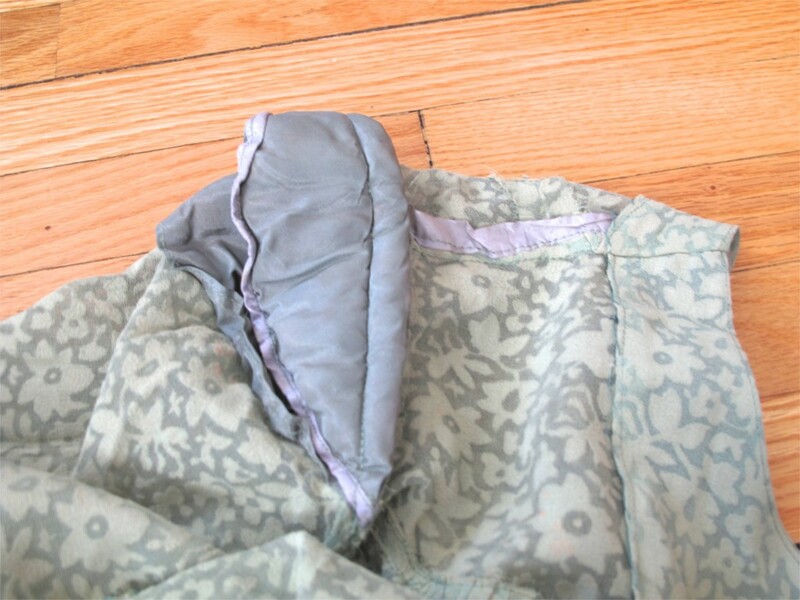 The back of the jacket uses princess seams. 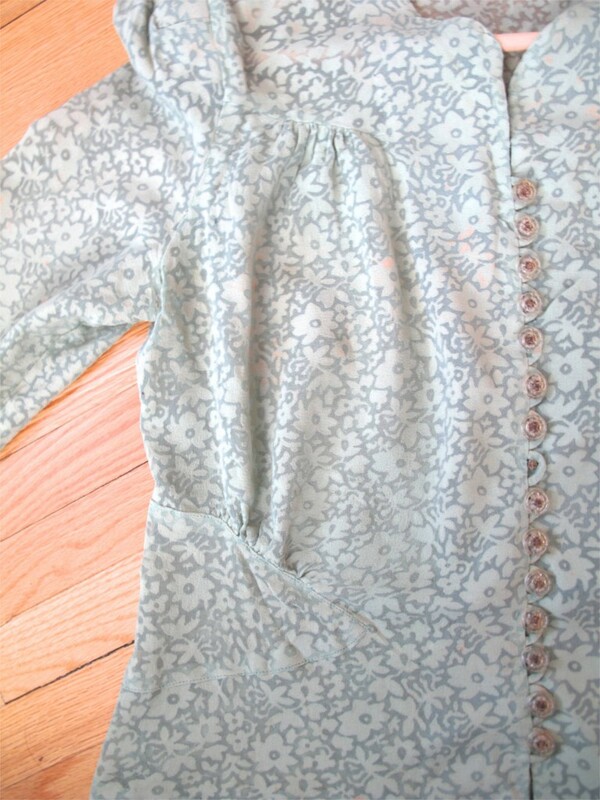 The front has a gathered, faux yoke at the top. At the waist there are triangular insets that allow for a second set of gathers. 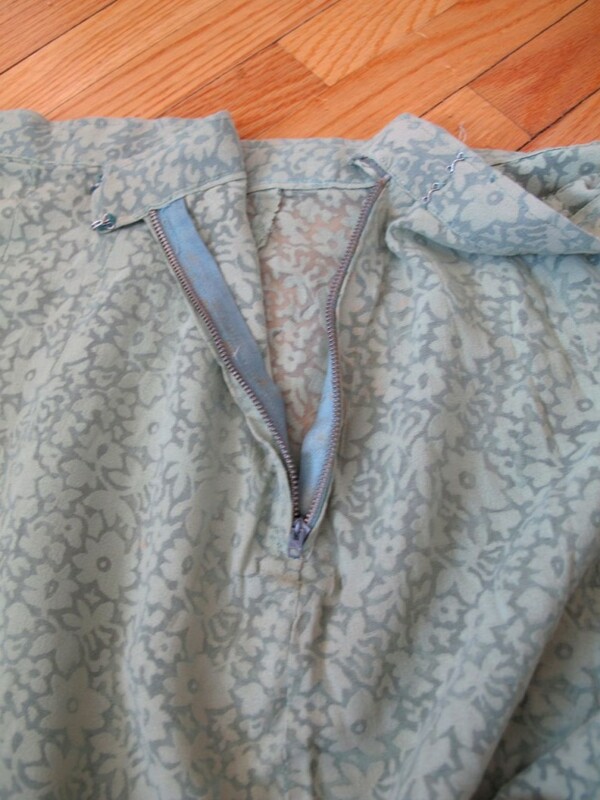 There is a row of clear plastic shank buttons that close with button loops up the front of the jacket. 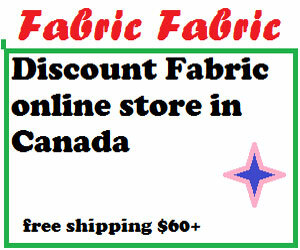 The jacket has a facing of synthetic fabric that is hand-stitched in place. It is also unlined. I think it’s about a 36 bust, so maybe, a size 18 in vintage sizes, and maybe a 10 today. There are shoulder pads to help keep the sleeves puffed and they are attached with seams. The sleeves are a little wider at the bottom. 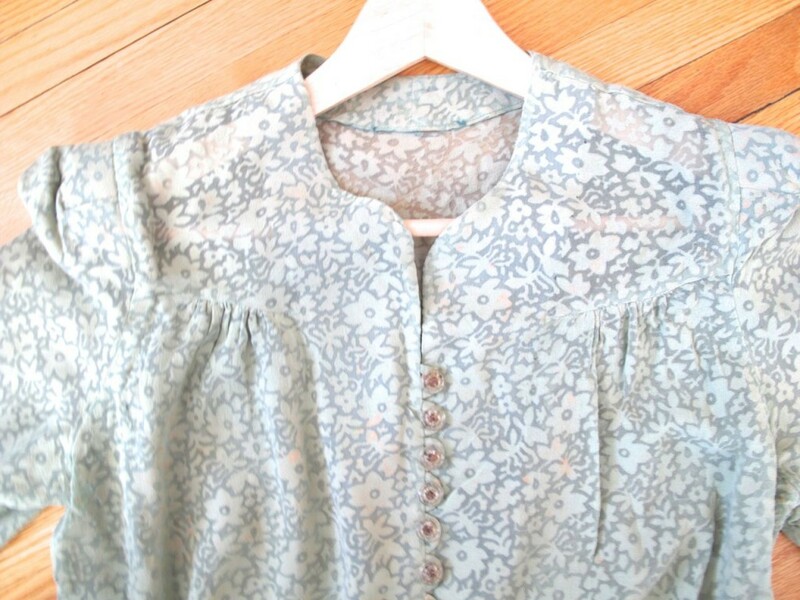 The dress is gathered in a faux yoke. There are buttons at the front. I think they were originally clear. They might be two-piece buttons that were glued together. The glue appears to be discoloured. A close-up of the triangular panels at the waist. 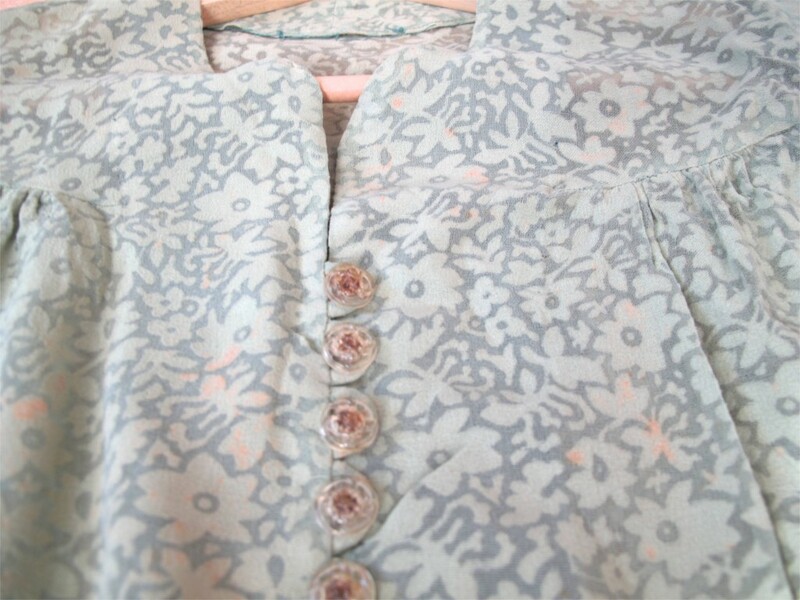 This is a better view of the jacket front where you can see the two areas that were gathered across the bodice. The dress is clearly hand-made. This isn’t a factory dress or a department store dress and there are no tags at all. At first I thought my grandmother made the dress. However, family lore says she bought it in Vancouver. It must have been from a local dress-maker. It’s made well with good techniques (ribbon in the waistband, etc. ), but shortcuts have been taken. 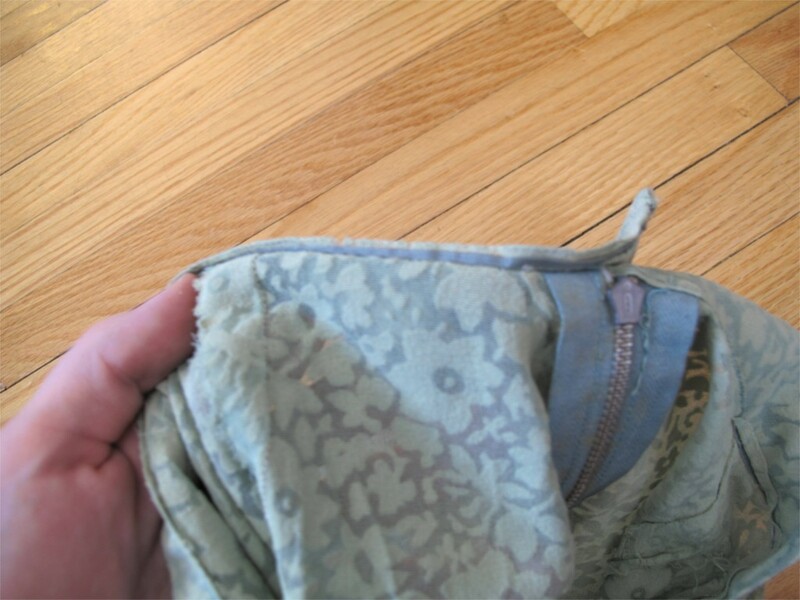 For example, the inner jacket facing is made of several pieces of fabric. 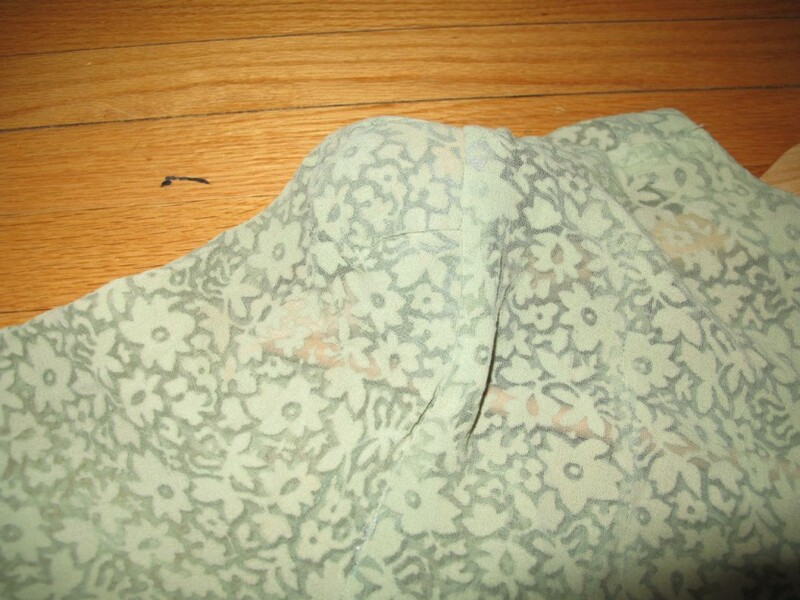 The facing is made of two pieces of fabric. The fabric is really quite sheer and very musty. I was tempted to hand wash it, but I did a fibre burn test on a small piece of fabric from behind the zipper. The fabric disappeared into grey ash. And then I took another tiny piece from the seam and hand-washed it and it shrank like crazy. I’m pretty sure this is rayon crepe. So I can’t hand wash it. Good thing I checked! It irons quite well though. The more I looked at the dress, the more I thought the dress itself would have been nicer if it just weren’t so green. I figure, if I use a fabric without a floral pattern, and choose something a little prettier I might end up with clothing I would actually wear. Blue maybe? Black? In a sheer fabric? But lined, definitely lined. So yes, I’m going to try to remake the suit in a better colour. This part is tricky, and I could use some help. The skirt is almost exactly the same as Simplicity 3688. You can’t really tell from the photo, but the technical drawing does show a three-panel skirt. It’s such a simple design that I could probably just use any a-line skirt pattern. It wouldn’t even have to be a vintage pattern. The jacket is another story. It’s is a little like the Vogue 8767 jacket. It’s even more similar to the blouse in Simplicity 3688. There is also the jacket in Vogue 1072. 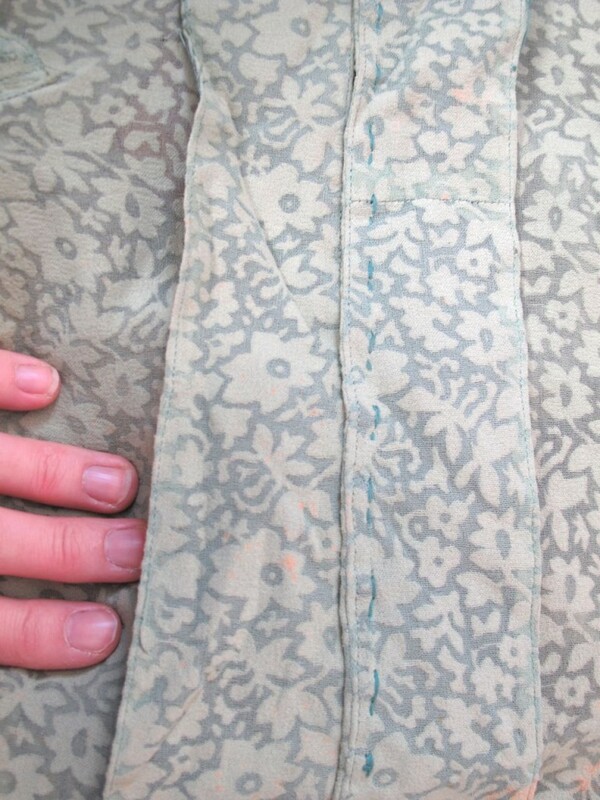 The part that is the most difficult to find, even in the vintage patterns I’ve seen, is the triangular insets at the jacket waist. 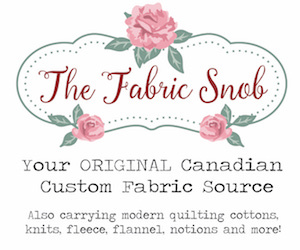 If I can’t find anything else, I’ll probably use the Vogue 8767, but I’m hopeful that I can come up with something better. Have you seen any patterns that more closely match the dress? Let me know in the comments. Oooh… tricky. I think I have seen the patches, but I am not sure where. I know back home in the UK, rationing went on even longer- it always astonishes me when reading about wartime rationing here in the US, how little they were really rationed and how quickly the rationing ended. I am sure that she must have worn a full slip, or slip and camisole. I’m thinking I will have to draft my own pattern. None of the usual vintage pattern places have what I need. Your Grandmothers wedding suit is so unique – I can’t wait to see your modern recreation of it! 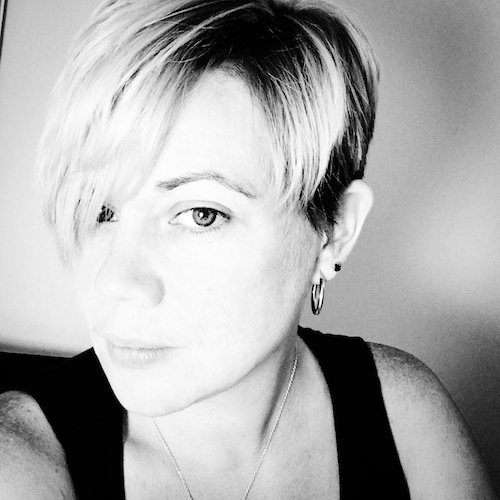 Gillian recently posted…When Crafting Hurts: How do you make it better?